Practice is the key to reading and spelling success-and now it's more fun than ever. Rock 'n Learn has turbocharged their best-selling Phonics video program with new animation along with sentence and story practice. Volume 2 builds on Volume 1, with catchy rhymes to make rules easy to remember. Delayed answers and our "on-screen mouth" let students check their reading and pronunciation. Read-along stories and fun songs provide practice applying the rules and building reading fluency. Context clues help students develop multiple strategies to read for meaning. Ages 6 & up. Approx. 78 minutes. 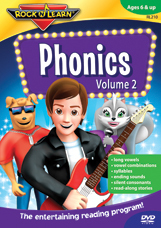 Rock ‘N Learn Phonics Volume 2 DVD is perfect for students after they've mastered the material on Volume 1. With Phonics Volume 2, students discover other ways besides "silent e" to make long vowels, such as: ai, ay, ee, and ie. They practice long vowel patterns and apply phonics rules by reading sentences with words that feature long vowel sounds. Students also practice reading words and sentences with r-controlled vowels, diphthongs, the schwa sound, syllables, ending sounds, and more. Eventually, students read stories that proceed from simple to complex. By also singing along with songs about the stories, students build reading fluency and have lots of fun. Rock ‘N Learn Phonics is designed to allow learners to practice specific chapters in the DVD as many times as needed before moving to other material. This self-paced approach allows repetition and fun review. as needed. Because Rock ‘N Learn Phonics DVDs have catchy songs and lots of humor, students enjoy working with the material as often as required to ensure mastery. Exciting new, animated characters entertain students and motivate them to build the skills for becoming confident readers. The little human mouth found on many sections helps students properly form the sounds and check their pronunciation. Busy parents appreciate an approach that's easy for students to use on their own. These DVDs differ from complicated kits that require a lot of time to understand and figure out before being used. You won't find a phonics video program more thorough and entertaining than Rock ‘N Learn Phonics DVDs. Kids are thrilled to work with the phonics video segments again and again. They take pride in their accomplishments as they build skills and boost their confidence. Rock ‘N Learn Phonics Volume 2 is developed by educators who recognize that students have different abilities and ways of learning. Teachers love an approach that facilitates differentiated instruction by including several different ways to practice the lessons. Plus, teachers can use our phonics DVDs with one group while providing individual attention to other students. The entertaining visual and musical format of Rock ‘N Learn Phonics DVDs engages students and gets results when other methods have fallen short. Students learn in a variety of ways, and our phonics videos provide an effective tool to meet individual needs and unique learning styles.